Call it the price of progress, but the paternoster cabinet at housing corporation Baston Wonen makes way for a DMS. Over 4000 dossiers will be digitized to be managed in OpenIMS DMS. The space a paternoster cabinet saves and the ease to rotate the compartments with suspension files vertically, doesn't compare to the quality and saving of time a good DMS has to offer. Certainly not OpenIMS DMS in connection with ViewPoint from Itris, the most common ERP-system in the construction sector. 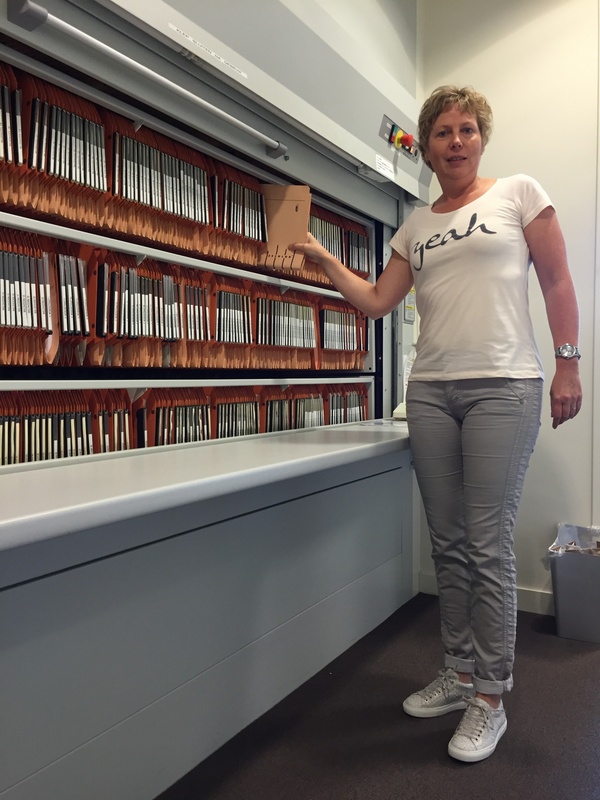 Priscilla Chris, mail and archive officer at Baston Wonen, demonstrates how easily compartments with suspension files are rotated vertically at Baston's office in Zevenaar. ,,The cabinet is two stories high. By rotating we can find the right file in no time." Nevertheless the ingenious cabinet makes way for digital dossiers. ,,A longstanding demand, for which we kept postponing the investment. With the change of management, we were given green light. We will benefit from the digitization more than the OpenIMS DMS costs. Besides, what really matters, are our residents. We can service them even faster and better. We always say: 'the better we have our house in order, business wise, the more we can do for our residents, socially'. The cabinet holds over 4000 dossiers in which Baston Wonen keeps track of services provided for residents, like all adjustments of their houses. ,,Imagine how the daily work of our inspectors will change. Lines of communication will be significantly shorter. Files will not get lost and are available directly. Updating files will be so much easier and faster. They can simply do that on the fly, in the neighborhood. And the updated information will be on their screen instantly. Important, because when a resident calls, our customer service can now see that an inspector just payed them a visit and which adjustments were done. Not only after the inspector updated the paper file here at the office." No staff of Baston Wonen needs to make new files or find existing files in OpenIMS. Like many housing corporations Baston Wonen works with ViewPoint. OpenIMS has a connection to this EP-system, whereby it can automatically generate dossiers of houses and residents in the DMS. Users can also navigate directly from ViewPoint to the right dossier and resident in OpenIMS. The ease with which Baston Wonen staff can get their paperwork in order, was decisive in the selection of a DMS, Chris knows: ,,It saves time we can spend on our residents. We therefor needed a DMS that's easy to work with, with insightful screens and without the need to keep clicking to get where you want. Also, testing learned us the accessibility of documents carries a lot of weight in the selection. People want to just type a keyword, like in Google. On top of all that, a nice look and feel helps. OpenIMS clearly meets our requirements the best. The technical management is easy as well. So now it's time to scan 4000 dossiers..."
Baston Wonen is a professional housing corporation in Zevenaar. Being a social enterprise Baston Wonen provides good housing for everyone, especially people with lower income and with special needs. The people working for Baston Wonen perform their tasks with a keen eye for the living environment. Core business are the construction and maintenance of rented houses. From the office at industriall site Mercurion the corporation rents out about 4000 houses, which makes it the largest renter in Zevenaar.